Well, so much has been going on, I haven't had time to write. I'll fill you in. First off, I made some new friends. They're from Calgary. The humans are Dan & Sue. but more importantly their dogs are named Cooper & Midge. 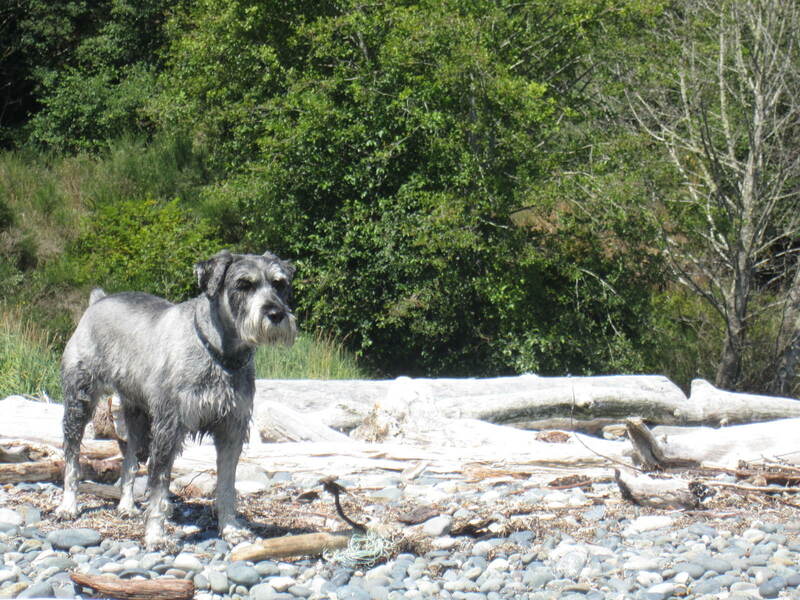 Cooper is a Schnauzer and Midge is a terrier mix. They are both really nice. Midge likes to go into the bush and look for rabbits and stuff. We went to the beach and it was fun. 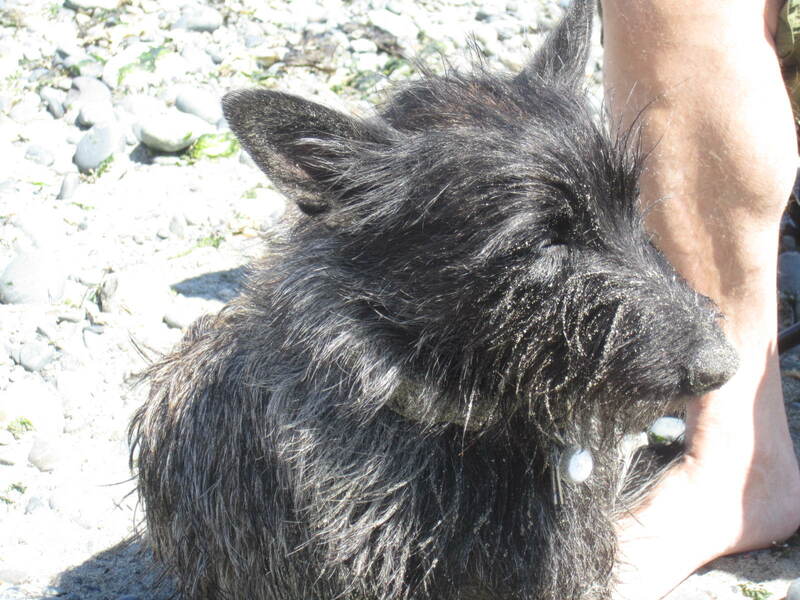 This is Midge all covered in sand. She's so funny. This is Cooper. He is our pack scout. He was always looking out to see if there was any danger. Then he would run back and tell us. Then, the best part was I went to Nanaimo! I got to meet Miss G. She is the little girl that gave me my name Princess Butterfly. It was fun meeting her. And you know what? When I got to her house, I found out we were both dressed in pink! I had my very best collar on that is pink and white pearls and my butterfly charm. I also had my pink leash! She had a pretty pink flower in her hair and her clothes were pink. How cool is that? 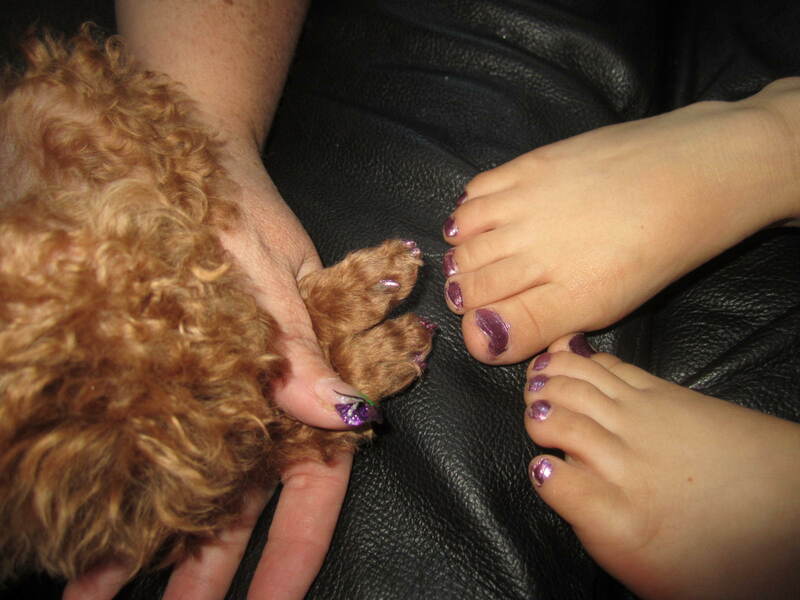 We visited with her for a while and then Momma put matching nail polish on our toes :) Miss G picked out her favourite colour. It is purple with sparkles. Momma said cause we had matching colors we were Princess Sisters. This is a picture of our matching toes. Miss G's Momma is wearing purple sparkle nail polish too. I guess my Momma is the only one that is not a Princess Sister lol.